If you really want to experience the Gettysburg Story, it takes more than one day. Join us for a two day tour which allows you to experience the whole story, and includes highlights that we are unable to include in our day trip, such as a full visit to the Battlefield’s amazing visitors center, dinner at a nearby historical restaurant, and, for those who want a different look at the battle, Gettysburg’s famous Civil War/Cat diorama at “Civil War Tails.” You can let us take care of your hotel accommodations, or handle them on your own if you choose. In many ways, the story of the Civil War is the story of America, and this story is told here, in Gettysburg, better than anywhere else. See where over 50,000 Americans of both sides became casualties. 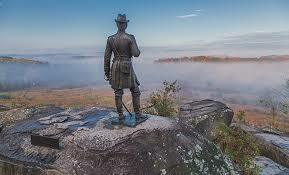 You will stand at Little Round Top where Colonel Joshua Chamberlain of the 20th Maine Regiment fought off Confederate Assaults, and see, also, the spot where the greatest speech in American History was made by our greatest President. You do not want to miss this tour!